In Ancient Greece, the city-state was a thriving center of population, culture, and commerce. The names of these great places echo through the halls of history: Thebes, Sparta, Athens. Each competed with its neighbors for power and glory, advanced its culture, erected magnificent buildings and temples, and warred against the others. Players oversee the governance of rival city-states in Olympus, a deeply strategic board game of civilization-building for 3-5 players. Players each attempt to grow a bustling metropolis, safeguard its people, and guide their worship. To become the ruling power of the Peloponnesus and achieve victory, you will require the favor of the gods and goddesses of Olympus. Seek their favors to grow your crops, inspire your engineers, and rally your soldiers to military conquest. 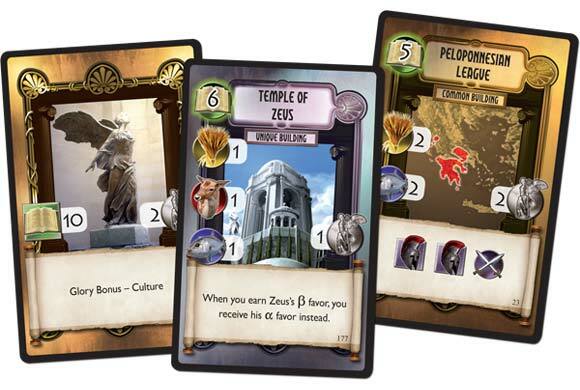 Olympus features dynamic game play driven solely by player decisions. Multiple paths may lead to victory, but wise leaders will always keep a wary eye toward their rivals’ developments. 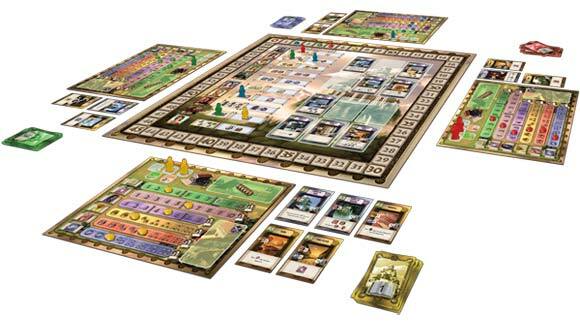 Unlike many similar games, Olympus offers rich opportunity and reward for player interaction. Can you lead your city-state to greatness? 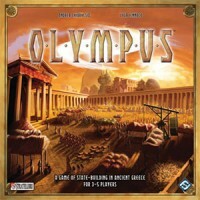 Rise to glory in ancient Greece with Olympus! I played Olympus several times. It’s a nice worker-placement game where you have to develop your civilization in 6 different ways using priests to ask for the favor of the gods. It’s important to play cards that represent buildings and discoveries, to improve quikly your 6 characteristics. There is some nice interaction using Apollo and Ares. In five players the game tends to be a bit too long. Graphics and components are good. Add a Review for "Olympus"